It's official: I am now turning to Michelle for all of my yeasty dough endeavors. You might recall that it was Michelle's recipe that restored my faith in homemade hamburger buns. Now she's done it again, and this time it's pizza dough. I've posted a recipe before--it's not worth linking to it now--but my feelings about it were lukewarm at best. What I really wanted was a chewy, substantial crust with great flavor and not too much bulk. I thought that I simply couldn't get it at home, at least not without building a dedicated pizza oven on my tiny little back patio. I was wrong. My problem was not the oven I was using (though I remain convinced that the very best pizza comes from those extra-hot ovens), but the dough. All that fuss over kneading, all that wondering whether I should use more oil or less, feeling like I couldn't make pizza on a weeknight unless I got home from work at 4pm: it's all over. Thanks to Michelle, I'm going the minimalist route from now on. And I'm not kidding when I say minimalist. The ingredients in this recipe can be counted on one hand. The active time is under 10 minutes, and that includes the kneading. The paltry amount of yeast will draw one of your eyebrows inexorably upward. In short, apparently there's an inverse relationship between the complexity of a pizza dough recipe and the quality of the resulting dough. This is the easiest dough recipe I've ever used. It's also the best pizza I've ever made. And it's not just shrug your shoulders and say "yeah, I guess it's better." This is a whole new ballgame. If you've been looking for a good, chewy crust, give this one a try. Don't be put off by the small amount of yeast, by the seemingly insufficient mixing and kneading, or by the lack of rise in the dough before you bake it. The gluten develops beautifully as the dough rests--I was amazed at how thin I could stretch the dough without it tearing--and the edge of the crust will bake up with just enough rise to give it a nice feel as you sink your teeth into it. But I'm getting ahead of myself. Once you've made your dough, once you've let it rest overnight or for two nights and you're ready to bake it into something delicious, you'll need a topping. I'm certainly not one to turn up my nose at a good, old-fashioned tomato sauce and cheese pizza, but sometimes I like to branch out into something new and different, maybe even new and extraordinary. And let's be honest: sometimes I'm helped along by having a lot of something in the fridge and wanting to enjoy it before it spoils. 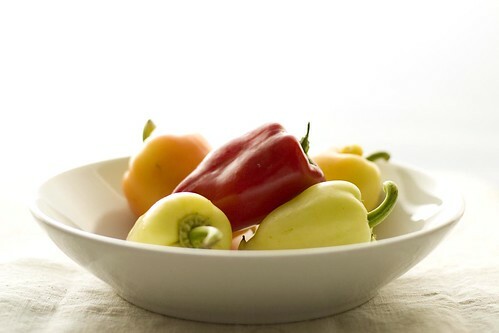 Yes, it's a bowl of peppers. I confess I'm not very good at using peppers. Oh, I can cook them just fine, the question is what to do with them. It wasn't very long ago that I first started liking them at all, so I'm still building up my arsenal of recipes for the summer months, when I get them by the bagful in my weekly CSA share. I've latched onto a few solid keepers, and this is one of them. This pizza comes from Chez Panisse Vegetables, and I could eat it for weeks. It is nothing more than peppers and onion, thinly sliced, tossed with herbs and a light vinaigrette. The result: sweet and tart, with a hint of bite from the onion, gathered together and grounded by the herbs. I'm often tempted to skip the pizza and eat the topping raw, as a salad, just so that I can enjoy it sooner. But the high heat of the oven brings out an extra layer of sweetness in the peppers, and they nestle so cozily into the cheese, that the pizza version is (so far) irresistible. Did I mention that the crust is pretty good, too? If you have a pizza stone, place it in your oven. Preheat the oven to 450F to 500F (230C to 260C). Combine the peppers, onion, and herbs in a medium bowl. Pour the red wine vinegar and 1/4 cup of the olive oil over the pepper mixture, and toss to combine. Coarsely tear, grate, or even slice the cheese, and set aside. Mix the minced garlic with the remaining olive oil. 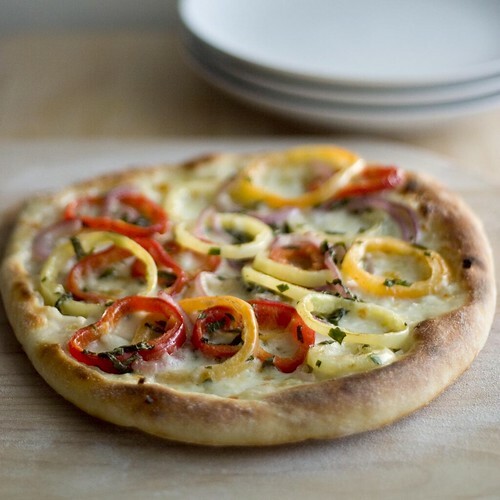 If you are using a pizza stone, dust a peel with flour or fine cornmeal. Otherwise, sprinkle a large baking sheet with the flour or cornmeal. 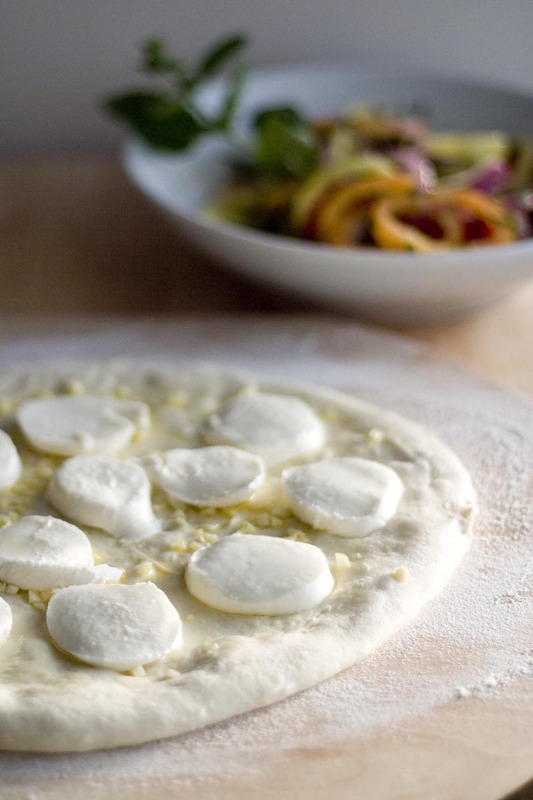 Roll or stretch half of the pizza dough to 12 to 14 inches in diameter, and place it on the peel (or baking sheet). Use your fingers or a pastry brush to brush the garlic oil over the dough. Don't be afraid to get some of the garlic bits on the dough, and make sure to leave a 1/2-inch border free of oil. Distribute half of the cheese over the dough, then top generously with the pepper mixture. 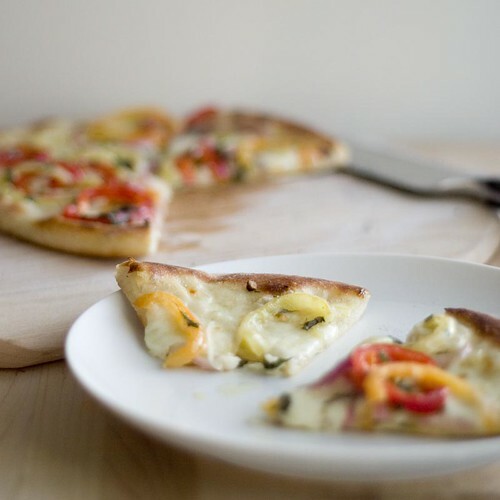 Slide the pizza directly onto the pizza stone (or place the baking sheet in the oven) and bake for 4 to 6 minutes. The pizza is done when the cheese is bubbling and the crust is golden brown. Repeat with the other half of the dough. Serve immediately. Variation #1: season the pepper mixture with thyme and either marjoram or oregano, rather than the basil and parsley; sprinkle the crust with crushed red pepper; and add chopped parsley prior to serving. Variation #2: season the peppers with cilantro and julienned hot pepper (jalapeno or serrano), and garnish with lime juice and more cilantro. Variation #3: if you're feeling very adventurous, use only spicy peppers rather than bell peppers. Slice the jalapenos crosswise, and marinated them in rice wine vinegar, salt, cilantro, and olive oil. Place 3/4 cup warm water in a medium bowl. Sprinkle the yeast over the water, and stir to combine. Set the mixture aside for about 5 minutes. Meanwhile, flour a baking sheet or other portable board and set it aside. Add the flour to the yeast mixture, sprinkle the salt on top, and stir gently with a wooden spoon until the ingredients start to come together. You can also do this in a stand mixer with the dough hook attachment, on low speed. It should take about 1 minute in the stand mixer. Once the ingredients have come together, increase the speed with which you beat the dough (turn the mixer up to medium), and beat for a couple of minutes. Finally, sprinkle a clean work surface with flour (not the baking sheet you prepared earlier), turn the dough out onto the board, and knead it gently with your fingers. There won't be enough dough to knead with the heel of your hand, so I find that fingers work best. The dough should be very moist, soft, and supple. Alternatively, turn the mixer up to high speed for 2 minutes. Divide the dough in half, and roll each half into a tight little round. Place the rounds on the prepared baking sheet, giving them several inches to spread out. Enclose the baking sheet inside a large plastic bag, and tie the bag loosely at the opening. Refrigerate the dough at least overnight, preferably for 2 nights. On the day that you make the pizza, pull the dough from the fridge about 1 hour before you intend to bake the pizzas, and leave it in a warm area. This dough is quite moist, so a bench scraper is very helpful when handling it. I have not had great success making multiple batches of this recipe at once, but that might be due in part to the fact that the one time that I tried, I crowded the balls of dough onto a too-small baking sheet. Give them plenty of space, otherwise they'll all smoosh together and you'll have a sticky mess on your hands. If you are baking with a pizza stone, try to let your oven preheat for a good hour before you make the pizzas. Your crust will be better for it. I like to turn on the broiler for the last minute or two of baking. I find that in my oven, at least, it results in better browning of the crust. I think you have just inspired me to take another stab at pizza dough, which I had previously sworn off (mostly due to inadequate rolling skills). Beautiful! You know, I actually prefer to work this dough into a circle by hand, rather than with a rolling pin. It's hard to explain what I do... I stretch it gently, mostly by letting gravity do all the work. It results in a more rustic shape, but I don't mind. And you don't have to worry about rolling skills! That looks GOOD! I will have to give this a go! I cannot try this one fast enough. In fact, I'm tempted now . . . but it is 1 am and I should really go to bed. This looks great! I think I'll try it this week-end. mmm, pizza for dinner tomorrow night, i think! :-) your pix are gorgeous!! what camera/lens are you using? Thanks! Hope you enjoy it. The camera is a Canon D60, which is now discontinued. The equivalent in Canon's current lineup is the 50D. It's a hand-me-down from my papa, and I love it to pieces. The lens for all of the photos in this post, and most of my photos recently, was a Canon 50mm f/1.8 II. It's very fast, very sharp, and very inexpensive (as lenses go). Many of my other photos--all of them early on, and gradually fewer once I got the 50mm--were taken with Canon's kit lens, a 28-135mm f/3.5-5.6, which is sort of a jack-of-all-trades (and master of none). It's been a good all-purpose starter lens for me, but it's not as sharp as the 50mm, and I don't think the color is quite as good. I just got another lens, a Canon 100mm f/2.8 macro, so stay tuned for some close-ups in future posts! ooo this looks great. 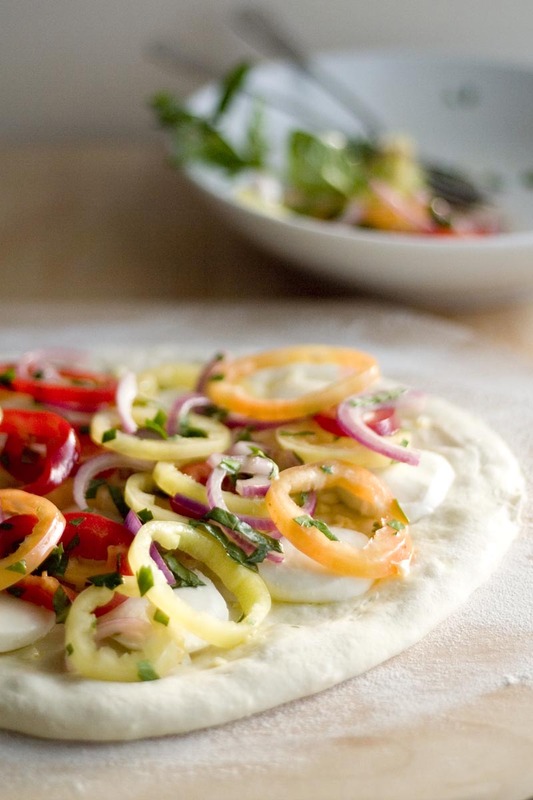 I've been experimenting with a lot of pizza dough recipes lately and haven't found the right fit for me yet - I'll have to try this! PS That Big Sur Bakery Cookbook intrigues me! Any special tips for trying this recipe without the mixer? "Add the flour to the yeast mixture, sprinkle the salt on top, and stir gently with a wooden spoon until the ingredients start to come together. " I love making my own dough! I was scared at first, too. But now I do it all the time!